Captopril is one of the most significant angiotensin-converting enzyme inhibitors. In spite of numerous experimental and computational studies on its properties, not enough geometrical and thermodynamic data is available on this compound. So, this study aimed to investigate the structural properties and assignment of possible conformers of captopril in the gas-phase. To this end, 1152 unique trial structures were generated by allowing for all the combinations of internal single-bond rotamers and pyrrolidine ring-inversion. A total of 119 conformers were found at the B3LYP/6-311++G** level after three sequential steps of optimization and their relative energies, dipole moments, and rotational constants were obtained. 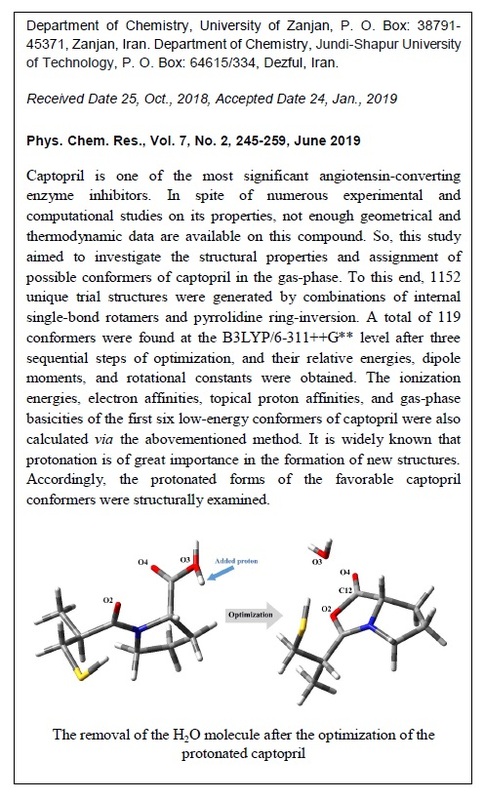 The ionization energies, electron affinities, topical proton affinities, and gas-phase basicities of the first six low-energy conformers of captopril were also calculated via the abovementioned method. As we know, it is widely known that protonation is of great importance in the formation of new structures. Hence, the protonated forms of the favorable captopril conformers were structurally examined.